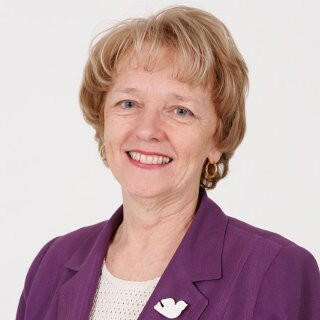 Alexa McDonough is an influential politician from Halifax, Nova Scotia, who spent close to thirty years in provincial and federal politics. She was one of the first women to lead a major, recognized political party in Canada. McDonough studied sociology and psychology at Dalhousie University. Before she became a politician, she worked as a social worker and teacher. McDonough served as a member of the Nova Scotia provincial Legislature from 1981 to 1994. After the 1981 election, she was the only NDP representative in the entire provincial legislature and the only woman. In 1995, McDonough was elected leader of the national NDP party. She was one of the first women in Canada to lead a major recognized political party, taking the helm from Audrey McLaughlin, the first woman to lead a major national party in Canada. While she was the leader of the NDP, she called for a series of important meetings to help decide on the future of the NDP and Canadian social democracy. McDonough remained leader of the NDP until 2003. She was reelected in the 2006 and became the first woman to be elected to four consecutive terms. She retired from politics in 2008 and worked for a year as the temporary president of Mount Saint Vincent University. In 2009 she was made an Officer of the Order of Canada. Mount Saint Vincent University created the Alexa McDonough Institute for Women, Gender and Social Justice in her honour.